Why does my crawlspace have so much moisture? Many studies have been made on why there have been so many problems with too much moisture in crawlspaces in North & South Carolina homes. Here at Air Concept Solutions, llc. we are well trained and educated in how to improve these common crawlspace issues. If the air in your crawl space contains water vapor, you have a problem. This is because your crawl space and many of the things that make up the building materials of your home are organic- especially wood (your flooring, sub flooring and beams) and paper (drywall coating, most ceiling tiles, etc). Organic materials can be destroyed by three main sources: water, heat or ultra-violet radiation. Of these three damaging forces, water is really the only one we can control. Why Remove Moisture From a Crawl Space? Keeping a dirt crawl space, a vented crawl space, or an unconditioned crawl space of any type under a home in South Carolina is a very bad idea. Crawl spaces in suffer dramatic changes in temperature and relative humidity through the changing seasons. This humidity or water vapor travels from the soil to the crawl space air and from there easily moves into the crawlspace itself and upwards into the house environment. About Crawl Space Moisture, Musty Odor, and Home Healthiness. Dust mites, humidity, odors, and insects create unhealthy environments for people. Many people are allergic and experience a host of symptoms. Often, these people suffer from the ill effects of a crawl space without even realizing that their crawl space is affecting their health. We’ve heard countless stories of how people felt sick in their own home with an unconditioned crawl space, and better when they left. 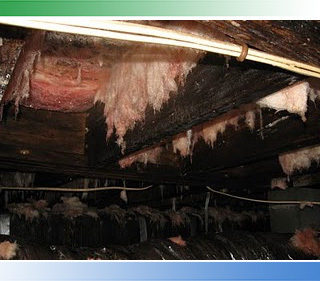 Our crawl space encapsulation system can help correct this problem. In the Southeast, basement construction is often not possible due to the high water tables and often houses are built over a crawl space. Most earlier crawl spaces have been use traditional foundation vents (also called wall vented). This type of venting system is vulnerable to moisture and can result in structural damage. The vented crawl spaces just cannot do an adequate job, especially when compared to the newer thermal, energy and health needs for housing. A sealed crawl space is a crawl space that is sealed and insulated from the environment. A sealed crawl space controls for moisture in the air which could otherwise wreak havoc on a space by allowing unwanted growth of unhealthy elements. A Sealed crawl space is actively controlled unlike a vented crawl space that is affected by environmental conditions. Using sealed crawl space technology, homeowners can be more assured of avoiding the moisture problems common in the Southeast. On the map below, the colors reflect different climatic and geographic data which include dew point and topography. Those in the southeast region find the most benefit from a sealed crawl technology that is available today. The ORANGE areas are regions that will experience the most benefit from sealed crawl spaces (as compared to a more typical vented crawl space). Sealed crasl spaces are also strongly recommended for areas covered by the purple portion on the map and . areas in GREEN would benefit from a sealed crawl space as well. Sealed crawl spaces can dramatically reduce your energy bill by allowing you to control the temperature and moisture inside your home. Average savings can be as much as 15% a year. Treated crawl space help equalize and reduce the moisture above and below your hardwood floors increases the longevity of your floors. Protect the longevity of your house with a sealed crawl space. Properly treated crawl space keep moisture from collecting around the foundation and walls which can cause damage to structures. To learn more about Crawlspaces visit the link below. Since 1980, Advanced Energy has been developing innovative programs, conducting cutting-edge research and analyzing real-world effectiveness for energy issues in order to deliver tangible results with practical, sustainable solutions for our customers, partners, members and the energy-using public. and the entire Charleston area.